1. Fix a candle in the middle of the small trough. 2. Fill the trough about half with water. 3. Place a long glass tumbler in the inverted position upon the candle. 4. Mark the level of water in the glass tumbler either by rubber band or with marker. 5. Remove the glass tumbler and divide the parts of the tumbler above the mark into five equal parts and name them 1 to 5 from the previous mark. 6. Now, light the candle and place the tumbler again over the candle in the inverted position. (I) The candle continues to burn, but the flame gradually gets smaller until it eventually goes out. (II) As the flame dies down, the water rises in the tumbler till it reaches a height of about first mark or 1/5th or 20% of total space. Why does the candle go out? 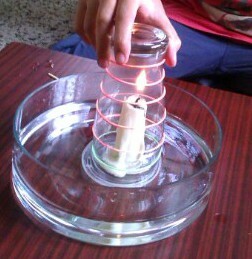 Wax of candle uses oxygen from the air present in the tumbler when it burns and form carbon dioxide in lesser amounts. When this happens, the candle cannot burn any longer due to the lack of oxygen. (b) Oxygen is present in the air. How much oxygen does the air contain? The water occupies the place of the vanished oxygen and fills about 1/5th of the volume of the tumbler. The content of oxygen in air is approx. 20%.